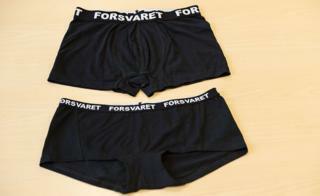 Norway's armed forces are going eco-friendly - in the underwear department. Military personnel will be kitted out in organic cotton underpants and bras in future, after the logistics division signed contracts with eco-clothing providers, the VG newspaper reports. "We think this is really great, and we have done tests to show that this underwear is nice to wear," says spokesman Simen Rudi. "That is of course very important for soldiers in the field." While buying organic cotton undies will be more expensive overall, "we aren't talking about a lot of money per unit," he adds. It's a boon for the local organic cotton clothing manufacturers, which are expecting to provide the armed forces with 50,000 pieces of underwear per year, the VG report says. Organic cotton is grown without the use of any synthetic pesticides or fertilisers, and is credited with being better for the environment than its non-organic counterpart. "When the military buys organic cotton, they contribute to fewer pollutants being spread in the environment where both the cotton and garments are produced," says Maiken Pollestad Sele from ecological organisation Oikos, which supports organic producers. "I think that by doing this, the military is really taking responsibility."